When I took the lid off the pressure canner after the pressure dropped, one of the jars was leaning to the side and there appeared to be beef broth in the once clean canning water. I took all the good jars out and this is what I found. The bottom had popped off the jar. In my small amount of experience, I had never seen this before so I did some web searching. 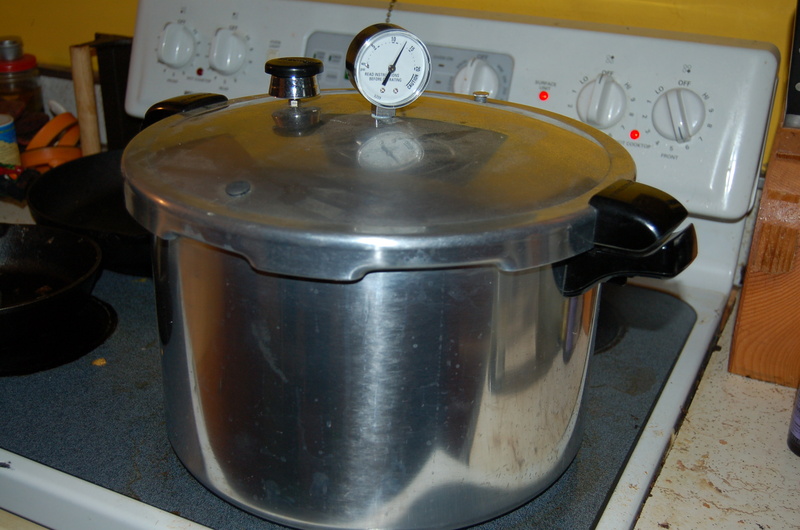 I found this website by the makers of my pressure cooker. I decided that the issue was likely that I had filled the jars up too much. I thought that I had stayed below where the threads started on all the jars, but looking at the jars, clearly I hadn’t. In my canning today, I will be much more careful about that so we don’t have a repeat of yesterday’s events. I have been packing up the house to move to the new homestead and I decided I should tackle the freezer today. A lot of the food looked awful and was full of frost. I don’t generally have good luck with freezing for any long periods of time. I also won’t have a freezer or even electricity at the new place, so I am going to try out canning. I have done a small amount before. But nothing more than applesauce. We recently bought 50lbs of meat, thinking we would eat it all by now. Not even close. 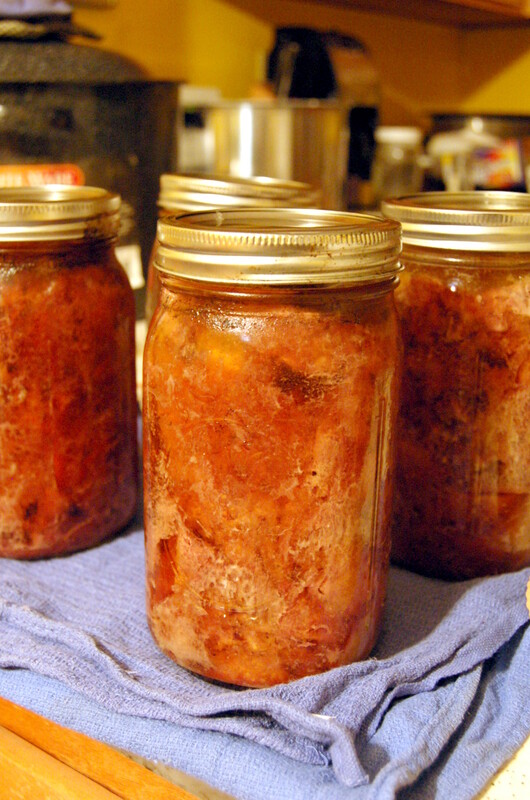 I have also heard that canning meat is one of the easiest things to can. Here we go. This is my first try at this, so here is the website I got my information from: Canning Granny. First, the Man made me some delicious beef broth, I will chat about this later. I cut up a ton of stew beef into about 1/2 – 1″ cubes. While I was cutting, my quart jars were in some boiling water to sterilize them. I also put the jar lids in warm water to soak. 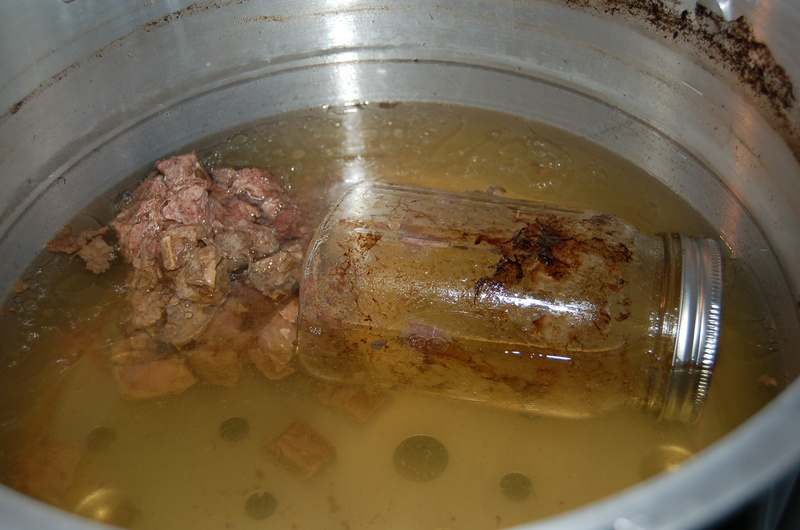 While the jars were still hot, I added the raw beef chunks and then filled them up with the beef broth. I filled them to just under where the threads begin. Take a butter knife or something similar and gently work the bubbles out. 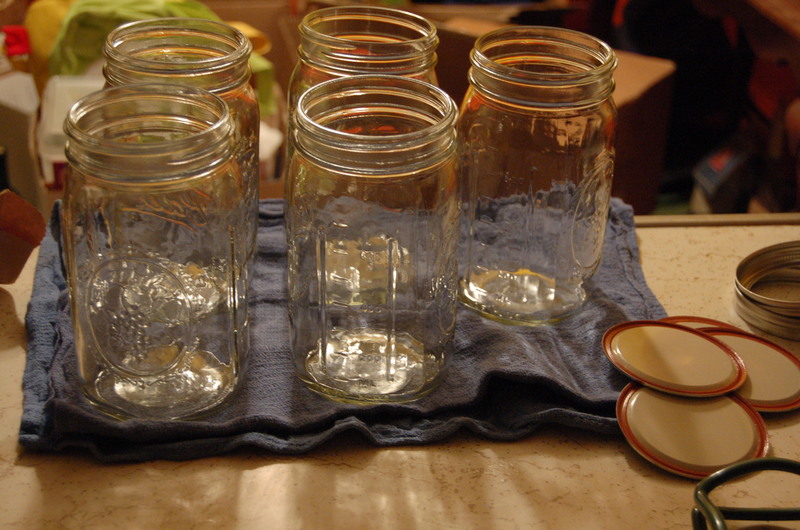 Once full, clean the jars with a wet rag. I only had a ladle to use, so I spilled some. They make these nifty little canning funnels, but I have yet to buy one. Put the jar lids on and then hand tighten the rings onto the jars. Put the jars into the pressure canner that is full only to the fill line. My canner is marked for pint jars and quart jars so you know exactly how much water to use. The recipe I followed said to use 15lbs of pressure for 90 minutes for quart jars. After the 90 minutes, I let the pressure drop to 0 before opening the lid. Use jar lifting tongs to pull the jars out of the still hot water. Set the jars on the counter to cool and listen for the pops! That’s it. According to the recipe I followed, this will stay good for 2-5 years. I just want to add it: I am not an expert and this is my first time trying this recipe. I may have left something out, so I suggest checking the link I listed and make sure to do it right. I always check multiple recipes for this sort of thing anyways just in case. It is always possible someone posted directions that are very wrong or missing steps that could cause bad things to happen. Be sure and be safe. PS: I had a little accident with this canning episode (no injuries) because I think these jars are too full. I’ll chat about this tomorrow or so. More often than not, people ask me why we aren’t doing something easier. “Why don’t you build a modular home?” “Why don’t you buy a house and just plant a garden?” “Do you even know what you are doing?” Why does everything always need to be easy? Why can’t I take 5 years or more to build a house and have it be the home of my dreams that I built myself. What is so wrong with having built something that is less than perfect, but knowing I did it and having pride in that? The reason we are doing things the hard way is too get away from the standard set in society today. There is no reason for us to work for many years to get a mortgage on a cookie cutter house just to spend the rest of our lives paying off the mortgage. People in general don’t believe it can be done. Well, we are among those who believe it can be done. I want my children to know that they can live a happy life without being in debt. How happy can you really be when you spend your life working a 9-5 for someone who doesn’t care about you at all? They care about their money and you are used to get them rich. I don’t want to be a slave. I want to do for myself and my family and others like us. I want full responsibility of my life and every aspect of it possible. Doing things the “easy” way puts you in debt and continues the circle of reliance. Why can’t I just rely on me and mine and have them rely on me? I want to go back to living in a small society where I know all my neighbors and we help each other and not in a society where I work for someone who doesn’t even know me, much less care about me. And no, I don’t have any experience. I’m sure it would be easier if I did, but not yet having experience is not going to scare us away from doing. We will gain experience as we take our time and do things step by step and make LOTS of mistakes. That is ok though. I will continue to work while we set up and slowly work less and less. We will have an apartment in town near my job at least the first year or so while we get established. 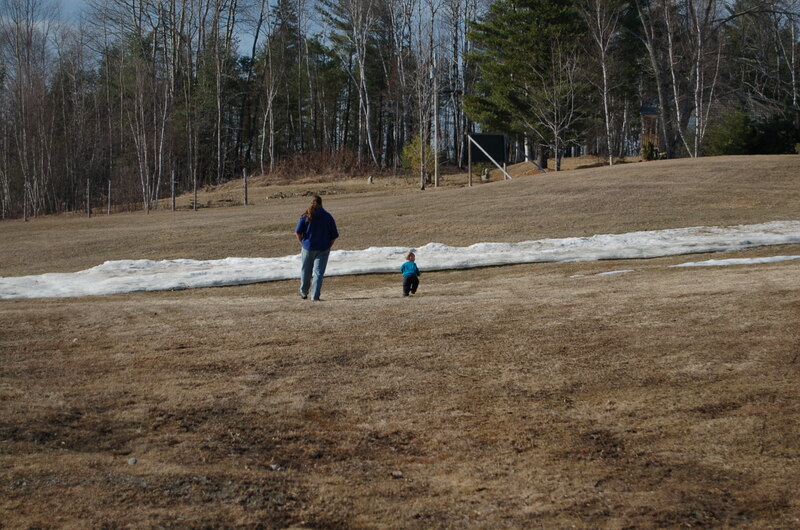 Maine winters are cold and we have two small children. Keeping them safe and warm is always number one, and like I said, we have no experience yet. Once we are comfortable with our experience level and the safety of the kids, we will move to the land full time and I will quit my job. If you really think about it, what we are doing isn’t all that hard. We always have backup plans and a safety net to fall back on. We really aren’t taking that many risks. All we are doing is changing our lives enough to get away from the norm. So we really aren’t doing things the hard way. We are doing things the way we like to think of as the smart way. Sure it’s different, but we wouldn’t have it any other way. 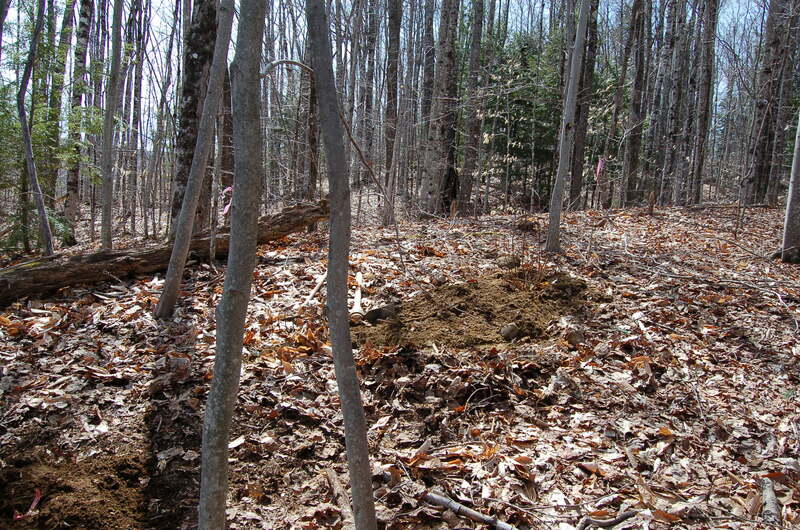 This is the spot where we ended up putting the food forest. It isn’t quite what we planned originally, but we weren’t going to be able to follow the plans this time around. We just didn’t have the time we needed to truck all the plants across the lot. 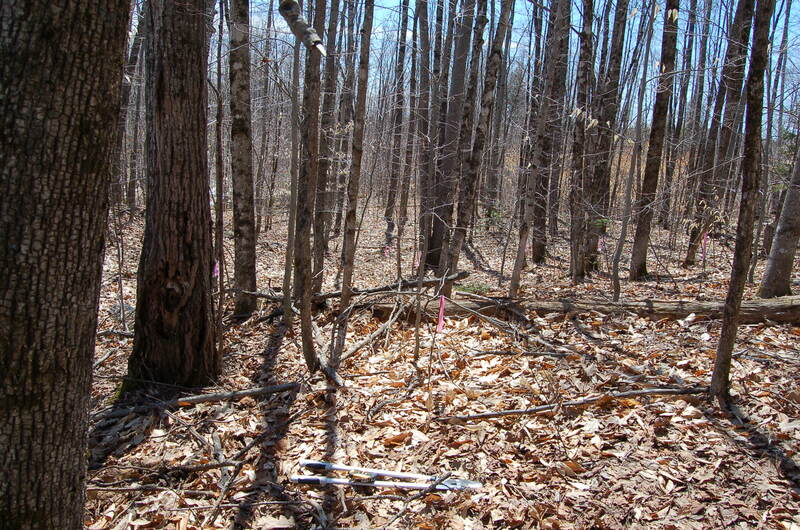 We put sticks with pink ribbons everywhere we wanted to plant a tree. 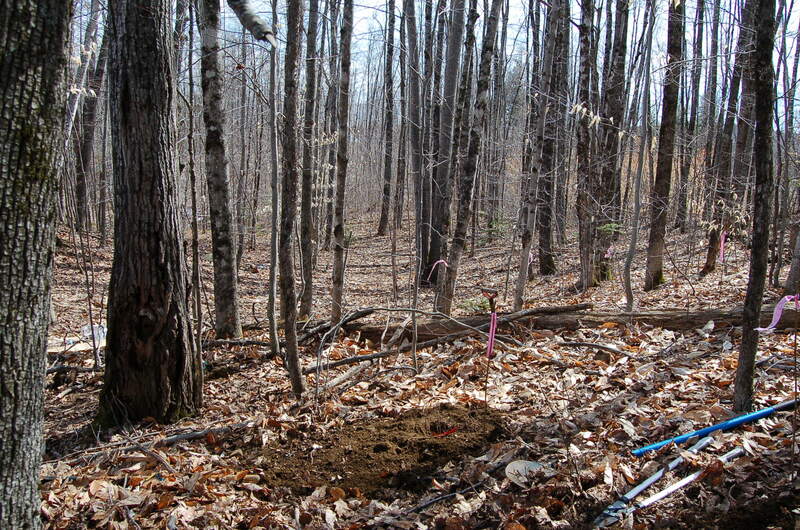 Being short on time, we had to position the trees around what was already there. I dread the day we have to cut down the trees that are in between out fruit trees. Hopefully we won’t kill them trying to get them more light. Digging the holes. 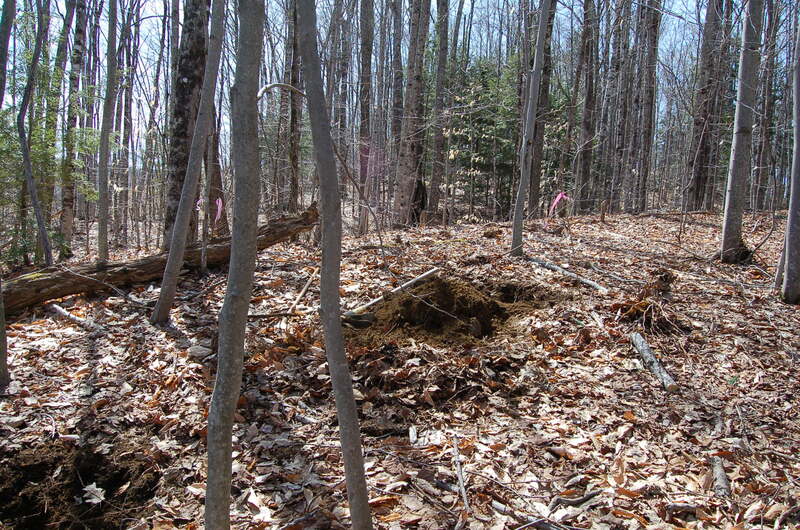 The spots where we planted trees were made into hugelkulture beds. I did not get the chance to take pictures of this because we were racing the rain. I did a post on hugelkultures before though. And finally, the plants in the ground. 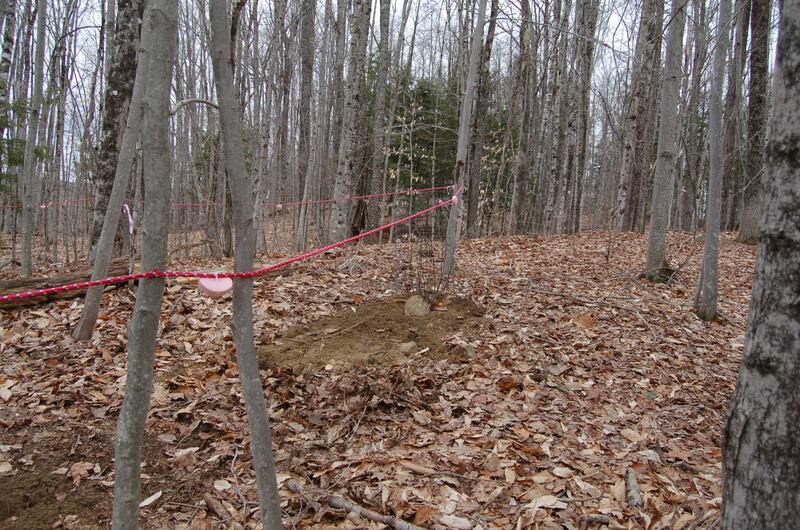 To protect from deer as quickly as possible, we put small fences around each tree. 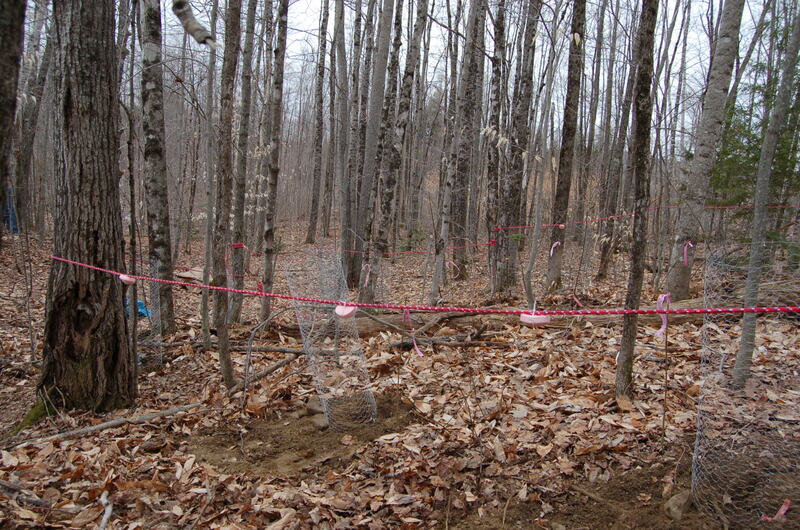 Most of the trees stick out over the tops of the fences, so we put up an additional perimeter. I used a red rope which will hopefully confuse the deer and then attached smelly perfumy soaps to the rope so the smell would further confuse the deer. I read that this would work for a little while, and we only need about a month out of it, so hopefully it will last this long. This is just another angle of the same food forest. 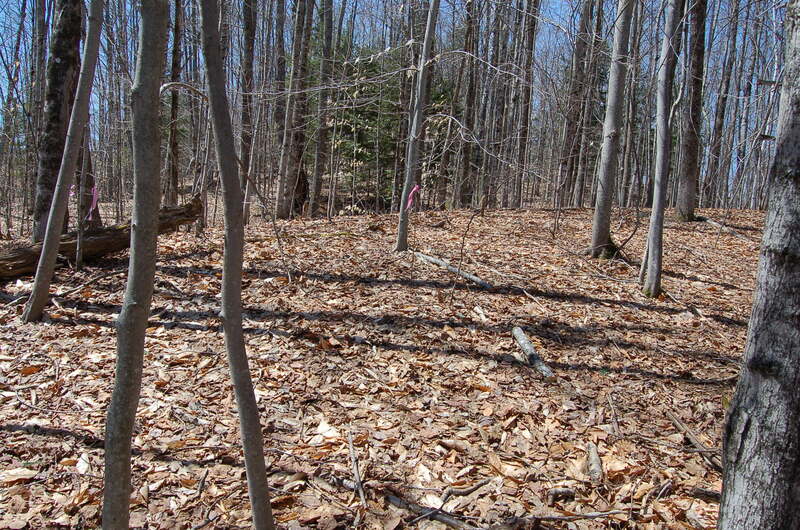 It is right up by the road, and will likely end up only being a small version of the real food forest. Next year, when we have the time to do what it is that we really wanted to do, I will follow the plans laid out initially. 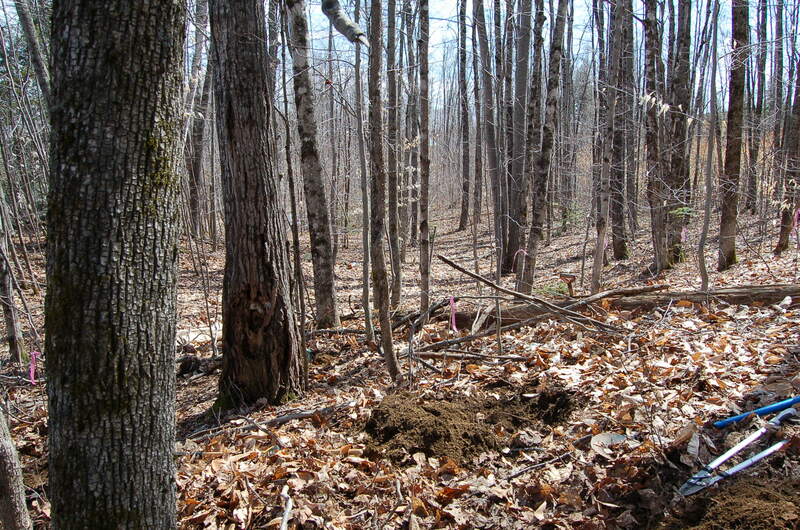 We may even move a few of these trees. And finally, the hazelnut is in the ground! I know the trees are still pretty small and don’t look like much, but I will take some more pictures as they grow and get some leaves on them. Then it will look like a little more. Just wanted to share with everyone what today was. 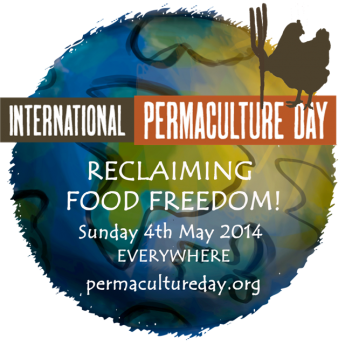 I got this great announcement from one of my favorite permaculture websites: permaculture.co.uk/. Another good one to check out is permacultureday.org/. They have a listing of workshops from all over the world. So get out there today and do something great to help celebrate the day. Plan a new garden, plant some perennial vegetables, build a cob oven, or even just sit back and spend some time learning about all the wonderful things permaculture has to offer. I will be doing some packing so that we can move to our new permaculture location at the end of the month, so not much celebrating for me today, but soon enough.